Thanks for stopping by for TIPsy Tuesday for a quick organization tip. I bet many of you have or plan to buy a Stampin' Up! Color Caddy for holding your stamp pads. This is a great investment if you have and use many of the full size SU stamp pads, either Classic or Craft. Some other brands will also fit. I have my Versamark pad and one full size Papertrey Ink pad in mine also. One of the best features of the caddy is the top portion meant to hold ink refill bottles. Personally, I don't reach for an ink refill all that often. So I keep those in a drawer near my stamp area. 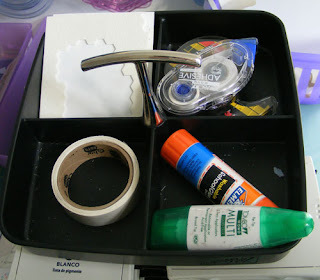 I keep adhesives in this top tray. The real estate on the desktop area is precious. I want things at hand that I really use. Tombow glue, glue dots, dimensionals and tape runner fit into the four compartments neatly and are always at hand. Repurposing is often the best way to 'make' space whether a minor change or a major overhaul. What have you repurposed for storage in your work area?